Dr. Jose Troche is a general doctor in the mountainous Yauco municipality of Puerto Rico and has been helping his community for over 20 years. After Hurricane Maria, Dr. Troche requested aid from the mainland in order to bring medical care, clean water supplies, and living supplies into remote Yauco. Following Maria, he donated countless hours of time conducting health and social welfare screenings on the weekend. The Figueroa Wu Family Foundation made their first delivery to Dr. Troche in November 2017. An estimated 1000 people have received supplies related to our November delivery. Evelyn Figueroa and Justine Landi, also from UIC, brought more supplies March 7-14, 2018 as well as labor support to improve water and housing conditions. Health and services fair in Yauco on 4 Feb 2018. Patrons received healthcare services (transportation is very challenging in this remote region [note the fallen trees behind the facility]), solar lanterns, hair cuts, food, clothing, and bottled water (more water filters are needed). A Chicago-based March 2018 fundraiser raised money for more water filters, solar lanterns, antibiotics, and over the counter medications. 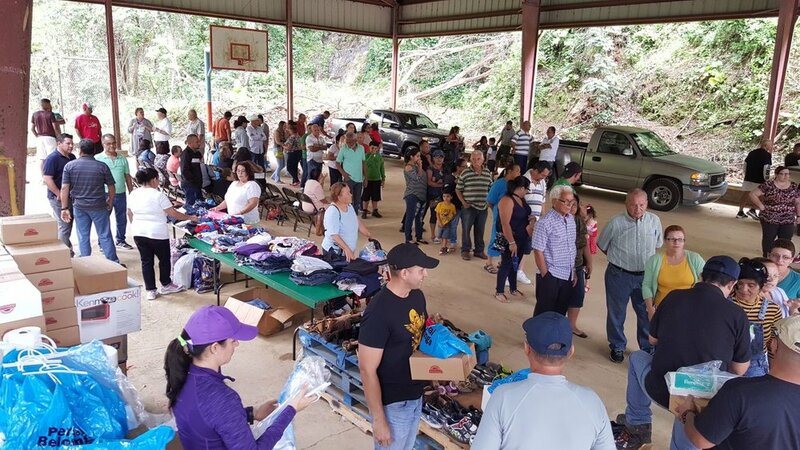 Patrons waiting in line in Yauco, PR for medical services and basic supplies such as lanterns, blankets, and formula. DR troche's medical brigades still need your help! Dr. Troche continues to visit the highlands in Yauco many weekends. Donations and volunteers are needed to help rebuild the community and improve their health. Medications mainly donated by Americares were sorted and the majority were given to Dr. Troche during Evelyn's trip in November 2017. December FWFF donations were used to purchase antibiotics (not donated in November) for people suffering from conditions related to the Hurricane such as basic skin infections, lung infections, and traveler's diarrhea. They are also in need of treatment for chronic medical conditions due to unsafe roads and damaged vehicles so the medical brigade makes regular trips to assist people in need of basic medical care and human needs.